When thinking about what to create for the New York edition of the States of Dress project, I -like countless others across the world- thought first of America’s most famous metropolis: New York City. The first time I ever visited New York as a young artist was during a massive garbage strike, and it left a lasting impression on me to see mountains of garbage piled so high on busy city sidewalks. I was raised in Chicago, where we have alleys to hide our garbage. I was surprised to discover that New York is a city without alleys, resulting in every home and business -even the fanciest restaurants- leaving their piles of trash right outside their front doors on the sidewalk. Even when there is not a garbage strike, as I found during many subsequent visits, the garbage bags regularly lining the sidewalks in New York take some getting used to. To me, the sanitation workers that mange these tiny mountains every week are the true heroes of the city. However, by no means did I mean any disrespect or want to create something “ugly” for this metropolis of art, beauty and fashion. 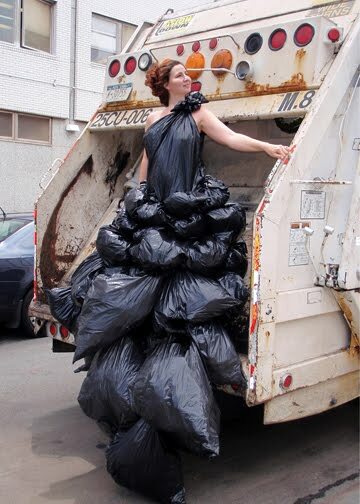 I therefore strived to create a “couture”, jet-black, fashionable New York dress, that just happened to be made from garbage bags. To me, this piece represents all the dramatic contrasts inherent to New York: wealth and poverty, art and homelessness – beauty and trash. To fill the bags, I used another New York icon – crumpled-up New York Times newspapers saved for me from the daily leftovers at the Marmara Manhattan Hotel. This was a great material to work with, filling yet lightweight. As an added benefit, the dress was recyclable when finished! And the beginnings of the project. I worked in an art studio in Brooklyn rented from fellow artist Rob Kimmel, who was out of town for the month with his family in Morocco. Special thanks to friend Stacy Lee who visited the studio and helped me stuff bags with newspapers! I also made a detachable train so that I could walk in the dress, then add the train at the photo shoot. OMG Robin, I can't believe we didn't talk about this today! (It was great meeting you at the Kooza / Mile High Mamas get together!) – But I LOVE THIS! And let me know if you need a photographer if you are making a Colorado dress! I would love to help out! P.S. Could I use more exclamation points?!?!?!? Really nice dress of new york i like it thanks for share these dress. 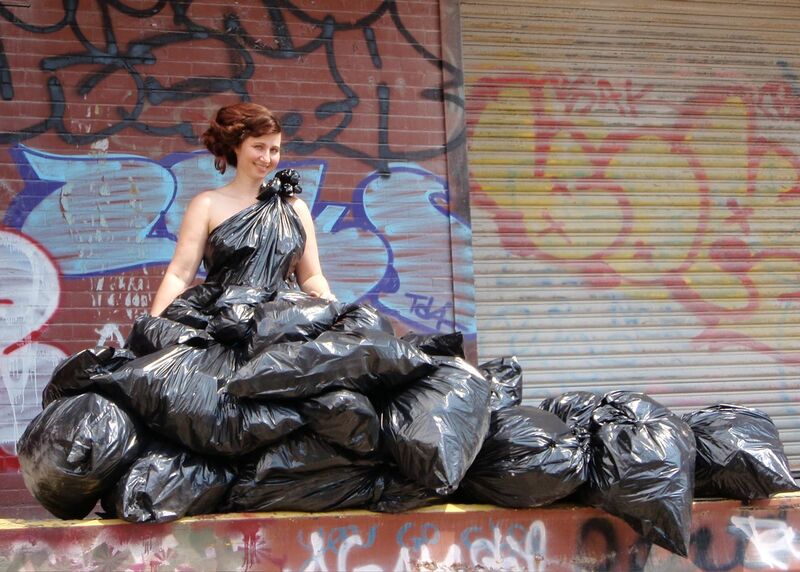 All these other states get beautiful nature inspired dresses and we get this crappy garbage bag dress???!?!?!? How about a dress made from playbills? considering these are STATE dresses – you should try to visit the other 98% of NY that is NOT NYC. I've lived in NYS all my life and have never been to NYC…. and it is NOT all garbage. Way to represent an entire state based on ONE city. Discoved your blog via the Yahoo story – and I'm really enjoying it! Have you done a Missouri dress yet? I agree with Kristy. If garbage was your strongest impression of NYC…well, then you need to see more of NYC. Even manhole covers or taxi cabs would have captured the spirit of the city more than garbage. How about all of the incredible skyscrapers and bridges? Central Park? And, as Kristy offered, Playbills? The lights of Broadway are gorgeous and so inspiring, and all you could come up with was garbage? What's next? A dress made of pieces from abandoned homes in Detroit? HI can you please make a Pennsylvania (or Delaware) dress next? It's where i was born and where i grew up and i know that there's not much to work with (besides things you already used) but i would be really grateful if this was the next dress! Hi Robin, I came across your beautiful dresses and will be following your blog in anticipation of the Oregon dress. May I use a photo of the NYC dress on my blog? I'd love to talk about you as an artist and link back to your blog. I think this is a really interesting project- but I am sincerely disappointed in your choice of material for New York state. As mentioned above by others, your theme is STATES of dress- not cities. And as a New York state resident who lives 7 hours away from NYC, I have to say I'm sad about this. First of all, SO many people in this country think only of the city when New York is mentioned- when we have so much more to offer! Our state is not just about NYC, as much as it is a wonderful place. The Adirondacks, the Finger Lakes- how about Niagara Falls? Even though NYC is the most well-known area, it's such a small piece of New York. And garbage- really?!?! That's so sad!! Other states have beautiful, inspiring, natural materials used- and NY State has so much more to offer in natural beauty than garbage! It saddens me when people think our whole state is just about NYC. This is such an interesting concept. Wow I absolutely love what you are doing!! It is amazing and I wish you luck with the rest of this project! New York has so much more to offer than just the garbage you saw in the city. It's really quite sad that you didn't even try to look at what the STATE has to offer and focused only on the city. There is so much more, like wine trails in the Finger Lakes, farmer's markets and harvest festivals, many of which draw crowds from out of the state,or similarly the New York State fair which is held a good 5 hours from the city, Niagara Falls, the Adirondacks, hell, if you were going to go with the city/state why not go with a theme of apples, considering the city is know as The Big Apple and New York is called the Empire state, as in Empire apples. What a let down to those of us who don't live in the city and were looking froward to something beautiful to represent our state, not just another thing that represents the city made by yet another person too lazy to see what else there is to offer from our state. I'm really disappointed. It is a fantastic and creative dress, but I'm afraid as a native New Yorker I have to agree with some of the other comments. Take your Chicago dress, it was lovely and made with dresses bought at thrift stores. Or most of the other dresses that have a nature theme. New York State as a whole is mistakenly thought of as just the city, like its only that or the whole state is a city. I moved to Oregon from upstate NY only four months ago and continously get comments when people hear where I'm from "How could you bear to live in the city" "hey, you don't have an accent"
There was all the rest of the state you could have chosen a better idea from, and I much agree with the apple idea. I grew up in the farm-y upstate area where we are famous for apples, also agreeing with the city also being called the Big Apple. Again, it was a lovely idea, but next time hit the STATE THEME instead of the CITY. That is totally amazing! What's your next state going to be??? You plan to do all FIFTY??? Where is Indiana's State of Dress? I completely agree with the other comments posted here. I was born in NYC but also have had the pleasure of living in upstate NY for several years (as well as other states across the country). To think that your limited view on one city could provide an accurate representation of such a diverse state is completely misguided. Would you represent the state of California with just your opinions of Los Angeles? I also echo the sentiment that the garbage bags are offensive and think that apple theme would have been much more appropriate. Clearly, you should have done more research into the state of New York. Shame on you for continuing to perpetuate such an inaccurate sterotype. do you have a facebook account for this project? I didn't locate one – – create one please! I'd love to link it and share it with all my friends! These dresses are fabulous! I don't even live in NY and was offended by the narrow minded, bigoted idea of the STATE of NY. Shame on you and please don't come to my state. I have seen your other dresses and think your whole concept is wonderful. Very ingenious and a wonderful way of bringing together an entire country through art. However when I looked at this dress, I could tell immediately that you were not from New York. It is true that on first impression, tourists usually have polar views. Either they are overwhelmed by the whole environment and think the place is like wonderland. Or they are disappointed and focus more on the flaws like robbery and drugs and garbage. Neither one is true. And it is your job as an artist to look past that. Even if you did want to only focus on NYC to represent the entire state,there are much stronger (and less negatively biased) statements you could have made. I know perhaps you think having the NY Times in the bags balances it out somehow, but you're not thinking from the viewer's standpoint. No one sees what is inside. They see garbage. And how is that fair? Unless you make a dress of rotten fruit or smelly fish, no other state will have a worse dress. And to me this project should not be about which states are your favorites, but how these different areas can be individually unique but also serve as a unit through fashion. Somehow 49 nature dresses and 1 garbage dress doesn't convey that. Call it art…I call it ignorance. As a proud sister of NYC's Strongest, a sanitation worker, this is ridiculous. My brother and many friends work around the clock to keep the streets of NYC clean. We have a greater population than any city yet we do a very good job in every aspect to maintain a fine place to live. And it's people such as Robin Barcus Slonina who epitomize NYC in a false way that is just plain wrong to anyone who doesn't know NYC. She made a dress with poker chips for Vegas, and garbage for NY. Now, her reasoning is that when she visited NY there were piles of trash and no alleys. Where did she visit and when? Did she walk one block? Did she ask if it was garbage pickup? The businesses and residences put their trash outside for sanitation pickup. We actually put our trash outside so it can be picked up. That's brilliant! So if she took the time to stay a while, she'd get it. Next – no alleys? Walk a little bit more, Robin. Take time to explore NY, or read a book. We can come up with a few for you right now – Statue of Liberty, Big Apple or the Empire State Building. You people. New York City is wonderful, but come ON. Even in the winter it smells like GARBAGE. What's the update on these dresses? The last post was more than a year ago. Has the project been abandoned? And I agree with the others: New York State represented as garbage was pretty narrow-minded. Perhaps New York's tourism bureau can treat her to a visit upstate? Ya know the people that are getting all upset about the fact that she chose garbage bags for NY really should read beyond just the pictures take the time to look at why Robin chose what she chose for NY…it is a shame that people can take something so positive and beautiful and turn it into something so negative just because they don't understand the reasoning behind it…. i think it is amazing and all of those people who disagree can try to do what you do and they will fail. it is so amazing and inspiring and you are so creative. I am from wyoming and love what you did, it is not what is perfect but what they have and what the state is. 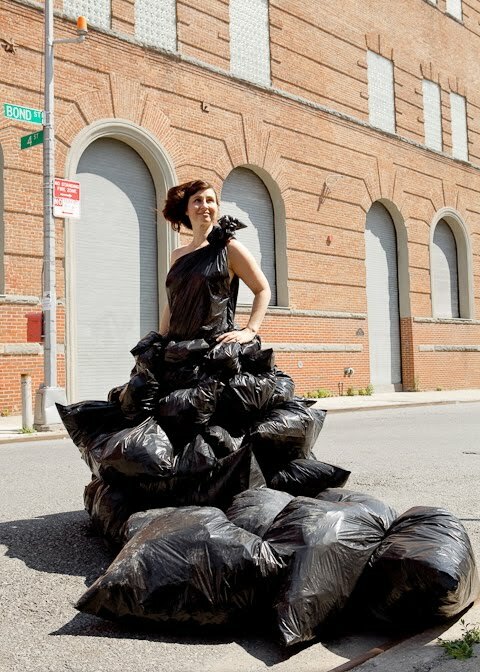 all of those angry people are just mad that you chose garbage but the dress was beautifull and you shouldnt change it. they are just a bunch of hot headed city people who dont understand your thoughts. and which, if the point of the dress was to represent an entire state (and not just a major city), then using garbage to represent all of NYS, is a totally misrepresentation. Stunning dress! What an artwork! I like it but I feel that it is expensive. The designer was good.